Our scheduling is a dynamic process! The PowerMD web-based scheduler makes scheduling a patient is easy, since all you have to find is an existing patient or just create a new patient from the scheduling pop-up screen. The scheduler suits office needs through features like daily/weekly/monthly calendar quick views, along with provider and visit information, and even custom notes. Automated appointment reminders are generated through emails to the patient. 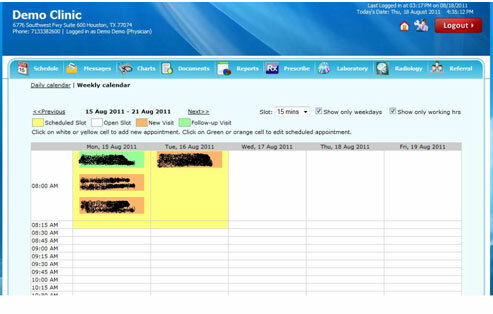 The PowerMD scheduler sends an upcoming scheduled visit notification to the patient’s provided email. The email appointment reminders include contact information, date, time, and other notes that could be included in the appointment reminder as well. The scheduling layouts are simple and sleek! PowerMD scheduling is an easy daily tool that enables for quick and ease of use data entry. Scheduling just got fun!